We live in an age where relationships are often initiated and ended via text or a swipe and where we all know at least one person who refuses to answer a call but is constantly posting on social media. We communicate via emojis and 140 characters, but can we really connect in such short interactions? Campfire, a relatively new organization in St. Louis, aims to reconnect people through in-person experiences and community building on a personal basis. Campfire brings storytelling back to the intimate, immediate, and immersive performance it once was. Through workshops, regular people are supported and encouraged to find their unique stories. At monthly storytelling events, a single speaker is given the platform to bring their story to life in ways that engender a genuine response from the audience. That response is typically active, rather than passive, and given on a strictly voluntary basis. Though the event is open to the public, the stories told during the monthly sessions are meant to stay at the Campfire, creating a sense of inclusion and safety. So, you won't be getting a summary of Kim Kreitner-Riegerix's storytelling debut in this article (although you can get a feel for the event through the Campfire At Home podcast). But I do want to tell you about the nature of the experience; about Kreitner-Riegerix's warm and generous approach and the themes she touched upon; and about the important sense of empathy and engagement that attending Campfire can inspire. Because those elements in this format are what make the experience memorable and exciting to anyone that enjoys a good story. Using humor and personal revelation, Kreitner-Riegerix guides the audience through her story of personal identity, perception, and her love of roller coasters. Interrupting her story to periodically invite the audience in, we are asked to say hello to the strangers around us and later to share a way in which we feel misperceived by others. There is an opportunity for audience members who want to express themselves to the group, but the majority of the interactions are self-directed, intended to spark thought and reflection. Though the focus is clearly on the story, this interaction feels a natural part of the telling. As Kreitner-Riegerix continues, her light touch and self-deprecating but positive voice shines through her adventures. She conveys her story by touching upon common insecurities and fears in a relatable, personable way. You may not have had her specific experience, but her tone and style let's you know that it's more than ok to fill in your own blanks and to laugh along. The entire evening implies acceptance and acknowledgement that we're all human, teeming with various strengths and insecurities, and doing our best to find happiness. Though not explicitly stated, finding and embracing your true nature are important themes that hit home. Storytelling is essential human behavior, enabling us to share common, practical knowledge while encouraging imagination and the ability to comprehend the abstract. What makes Campfire stand out as a storytelling event is the communal and interactive nature of its structure and format. The evening is intentionally engaging, as you enter the performance space you are asked to create a name tag that includes the answer to a simple question pertinent to the storyteller's theme. The stories presented at Campfire can be quite personal, but we're introduced to the topic through seemingly innocuous bits of information. The effect is subtle but immediate, as audience members take their seats they are already thinking of the themes they're about to witness. Campfire bills itself as being like "TED without the data, The Moth but interactive, and Church without the religion." My understanding of Campfire is based on my attendance at a few sessions and conversations I've had with Steven Harowitz, other staff, and audience members. What I see is a group of creative performers and artists committed to the principles of storytelling and community building. There's a healthy, positive vibe to the group and a focus on developing people with interesting, varied perspectives and experiences into engaging, compelling storytellers. Sharing is encouraged at Campfire, but in smaller gestures and introspective actions. Campfire is not, after all, a storytelling slam; it is intended to reignite ages old traditions in a way that resonates with modern audiences. Campfire aims to slow moments down and encourage reflection. 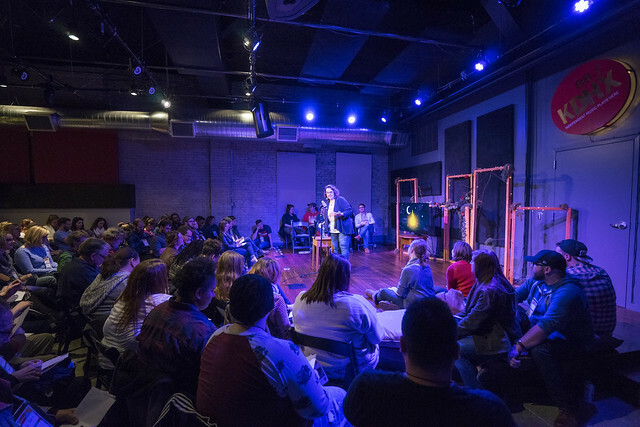 Participants, whether storyteller or audience members, are encouraged to really listen and connect with each story told. They are then encouraged to listen to and connect with those around them. According to the Campfire website, the organization "wants to share everything we've learned after years of storytelling through public speaking, improv, journalism, marketing, and podcasting." What they're building in St. Louis is a welcoming space for a less theatrical, more personally immersive form of storytelling. You can check out the unique Campfire experience for yourself by joining storyteller Cambrie Nelson at The Stage at KDHX on Wednesday, April 19, 2017. Admission is free, doors open at 7:30pm, and Nelson takes the stage at 8pm. Click below to see Tim Farmer's photos of Kim Kreitner-Riegerix Campfire appearance March 15, 2017.